HARD ROCK CAFE NAGOYA, JAPAN. 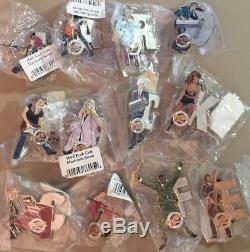 Musician Letter Series Puzzle 12 LAPEL PIN BADGES! ALL 12 are new in original HRC baggies! HRC DALLAS set pictured above to show how they fit together. Each letter "looks like" a famous Rocker. 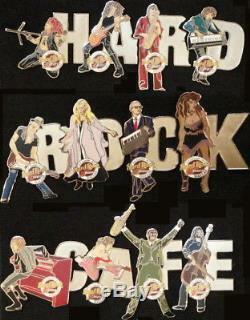 I can see Tina Turner, Jerry Lee Lewis, Eddie Van Halen, Bob Dylan, Clarence Clemons... Can you guess the others? 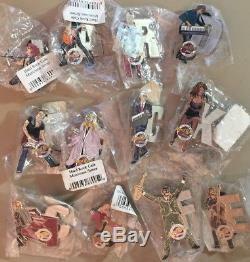 The complete set has 12 letter pins. "H" - "A" - "R" - "D" "R" - "O" - "C" - "K" "C" - "A" - "F" - "E". The item "Hard Rock Cafe NAGOYA 2001 Musician Letter Series 12 PIN Puzzle SET 30 Year 30th" is in sale since Sunday, May 27, 2018.